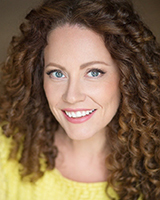 Kristi began her professional career in Los Angeles after studying opera and jazz vocal performance and receiving her Bachelor of Music degree from Cornish College for the Arts in Seattle, WA. Los Angeles theatre highlights include being a cast member in critically acclaimed productions at The Hollywood Bowl, Reprise! Broadway’s Best and local Civic Light Opera theatres. Some of her favorite roles include Julie in CAROUSEL, Johanna in SWEENEY TODD, Anne in A LITTLE NIGHT MUSIC, Hodel in FIDDLER ON THE ROOF and Lily in THE SECRET GARDEN. For over 5 years Kristi starred as Christine Daae in the multi-million dollar Las Vegas production of THE PHANTOM OF THE OPERA, directed by legendary Broadway director Hal Prince. She was honored by the Las Vegas Review Journal in their 2012 BEST OF LAS VEGAS awards as BEST SINGER on the strip for 2012. Soon after the Las Vegas production closed Kristi was given the incredible opportunity to reprise her role with THE PHANTOM OF THE OPERA WORLD TOUR performing across Asia and Europe. Kristi has performed as a solo artist with the California Philharmonic at the Walt Disney Concert Hall and premiered in Los Angeles with ensemble GREEN the 9 piece song cycle, A HOPEFUL PLACE, written for her by Dan Redfeld (composer) and John Koladziej (lyricist). A gorgeous fully mastered recording with 18 of the top LA union musicians released by PARMA Recordings, now available on iTunes and Amazon. Kristi produced and performed in her own benefit concert, SINGING OUTSIDE THE LINES, while in Las Vegas to raise money for the Las Vegas chapter of FAMILY PROMISE, a wonderful charity that helps homeless families stay together while they get back up on their feet. In addition to the honor given by the LAS VEGAS REVIEW JOURNAL, Kristi has been recognized for her contribution to the Los Angeles theatre community with a Robbie Nomination (Julie in CAROUSEL, Cabrillo Music Theatre), two Inland Theatre Awards (Anne in A LITTLE NIGHT MUSIC/Johanna in SWEENEY TODD, Performance Riverside).